Speed of communication and growth are some of the key competitive advantages in the international business world. Thus, it is very important that international business executives are able to commute around the globe within short periods of time. This has inevitably influenced the success of the airline industry, with over 2,000 airlines in over 3,700 airports worldwide. At St Theresa, we invite you to be a part of this grand opportunity. Our Airline Business program offers students with dynamic and modernized courses that keeps up with the ever-changing needs of the airline industry. Fine-tuned by airline industry experts, the program has been designed to prepare students in gaining essential business skills together with real-life airline-related practices that are needed for a successful career in the airline profession. Completion of the program means that you shall be ready to achieve your dreams in a dynamic and highly competitive industry. Airline Business major aims to produce first-class graduates in the field of airline business. Our students will experience an international learning environment as all courses are conducted in the English language. Friendly facilities such as simulated cabin mock up together with courses directed by experienced airline experts and academic professionals, shall prepare students for the career challenges ahead. Through field trips, our students will have the chance to visit numerous airline business industries such as Suvarnabhumi Airport, TG Operation Center (OPC), Thai Airways International Cargo and Thai Catering where they will be well familiarized with real-life routines. Our program includes “On-the-Job-Training” opportunities for 4th year students, with the purpose of engaging them in practical skills needed for professional development within both, local and international airline industries such as Nok Air, Qatar Airways, Air France, Lufthansa, AirAsia, Thai Airways International, Thai Airways Royal Orchid Lounge, Emirates, Austrian Airlines, EVA Air and the Airport Authority of Thailand (AOT). 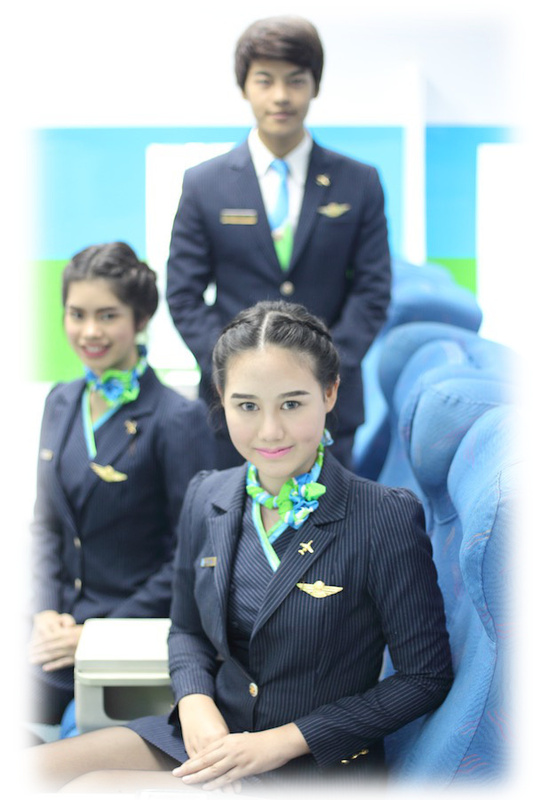 Graduates will be ready to step out and obtain prominent positions, working together with professionals in the airline business, not only locally, but at an international level as well. If you are dreaming of being a part of the Airline Business world, we would like to welcome you all aboard St Theresa International College. Choose any 3 courses from the following list. Choose any subjects offered by St Theresa International College that is not repeated with the already learned subjects. Click any of the listed courses to view its description. Whenever asked to list the different jobs available in the airline industry, most people immediately imagine the pilot and cabin crew. Although they are important positions, there are many other roles that are crucial for the success of the airline industry. After completion of our Airline Business program, you will be prepared to take on many various positions in the airline industry – there will almost be no limit on how high you can fly! Since 2013, the Bachelors of Business Administration program in airline business has been fully accredited by The Higher Education Commission. We are also assessed by Quality Assurance Committee annually to enhance the quality of the program in order to ensure the delivery of highly qualified airline business graduates whom are able to compete in the rapidly growing market. We are also long-term partners with numerous domestic & international airlines and state enterprises who have been generous in providing internship opportunities and real-life experiences to our students. Applicants must have successfully completed high school (M.6) or equivalent. Applicants should have satisfactory proficiency in English language. Applicants must be of good moral character and have good mental health and no contagious disease. Completed application form and fees. Certified true copy official transcript of records. Certified true copy of National ID card or passport. Two (2) recently taken 2×2 inch photographs. Certified true copy of name change certificate (if any). Fill out the form to get in touch with us..